Sunspot 1101 is big but quiet. Overall, solar activity is very low. 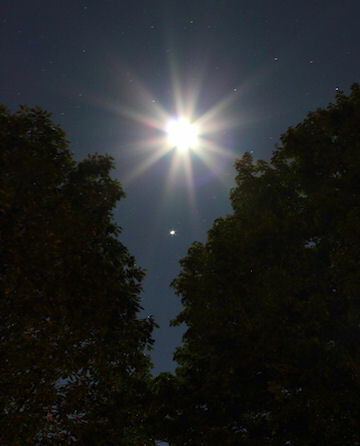 BEWARE THE MARS HOAX: According to a widely-read email, Mars will appear in tonight's sky as wide and bright as a full Moon. Imagine the tides! Don't worry, it's just the Mars Hoax. This is a first light adaptive optics image from the New Solar Telescope (NST) at the Big Bear Solar Observatory in California. "With a 1.6-meter primary mirror, the NST is the largest solar telescope in the world," says Nicolas Gorceix of the observatory staff. "It has realtime correction for atmospheric distortion (adaptive optics), so we can see things in very high resolution--as small as 65 km wide on the sun." "For perspective," he adds, "Earth is slightly smaller than the whole sunspot including the dark umbra and the daisy petal-like penumbra. The spot is surrounded by the sun's ubiquitous granular field [which shows the boiling motions of the sun's surface]." 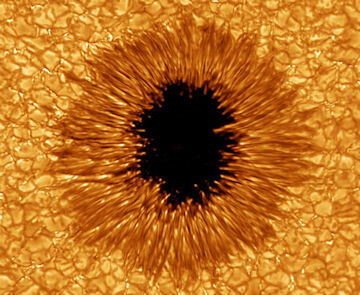 Researchers believe that high-resolution studies of sunspots can help them understand how sunspots evolve and anticipate when they're about to erupt. "Next year, we plan to upgrade the telescope with a much higher-order adaptive optics system to get even better images," says Gorceix. Stay tuned to the BBSO home page for updates. Readers, did you miss it? An even better version of this conjunction occurs next month. The Moon and Jupiter will meet again on Sept. 22nd when the Moon is full and Jupiter simultaneously reaches an 11-year peak in brightness. Mark your calendar! On August 27, 2010 there were 1144 potentially hazardous asteroids.